A CO2 laser engraver is not engraving glass as much as it is actually etching or marking it. In recent years glass etching has become a growing and in demand CO2 application. Laser machines are ideal for handling and creating beautiful clean etched glass designs since they are less expensive, offer more flexibility, considerably faster, and easy to manipulate. Also, compared to traditional glass engraving techniques like mechanical engraving or sandblasting marking glass via. CO2 laser is considerably more repeatable and forgiving. The end result is a sophisticated yet beautiful frosted effect that can be use to highlight logos, images, text or any other design you want etched into the glass surface. Many glass objects are cylindrical but can still be etched through the use of a rotary attachment. This can be purchased in addition to any IEHK Laser machine and will enable you effectively rotate the item as the laser etches your custom design. With the exception of leaded crystal (because of it’s metal content) most glass materials can be engraved with a CO2 laser. The best type of glassware to etch is the less expensive every-day type of glass that doesn’t have a high lead or metal content. 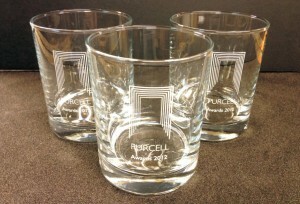 Keep in mind when it comes to etched glass you will want to keep the glassware as cool as possible throughout the etching process. You can also contact us to receive samples if you’re interested in seeing what a finished product might look like.